#U1205 (circa 1861) Below knee chemise with lace trim. 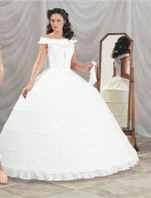 #U1206 (circa 1861) Below knee chemise with trim. 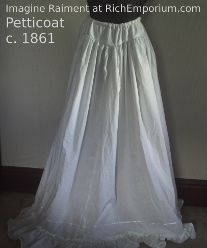 #U1209 (circa 1861) Civil War era petticoat (pictured here with hoop #U1201, corset #U1207, and chemise #U1205, which can be ordered separately). Banded waist and very full ruffled skirt. 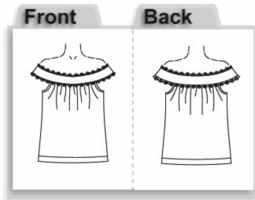 #U1210 (circa 1861) Camisole with trim. 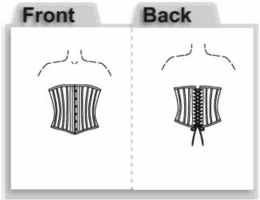 #U1211 (circa 1861) Corset for use with petticoat, chemise, and hoops. 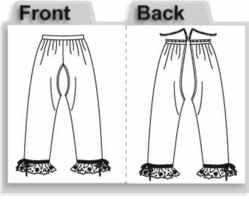 Laced back and hook and eye front fastenings. 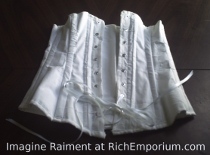 White fabric with boning. 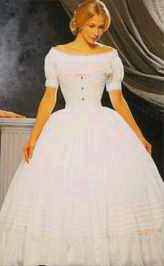 #U1215 (circa 1861) Complete ensemble including #U1206 chemise, #U1207 corset, #U1209 petticoat, #U1212 hoop, and #U1214 pantaloons. #U1216 (circa 1861) Camisole. In white. Trimmed with lace and ribbon. #U1217 (circa 1861) Camisole. In white. Trimmed in lace and ribbon. #U1218 (circa 1700) Camisole. In white. Trimmed in lace and ribbon. #U1219 (circa 1870) Bustle. In white. Trimmed in lace and ribbon. #U1221 (circa 1835) Victorian hoop. 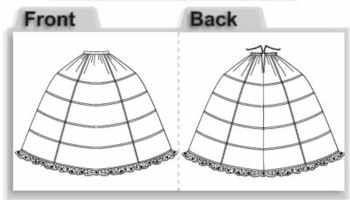 This is a narrower hoop than #U1212 or U1215 and is meant to be used with reproductions of costumes worn in 1830-1850. In white. Trimmed in lace and ribbon.